Sorry about the late post, everybody. It's just that this comic was too scary to work on at night. The Wendigo is a mythical creature appearing in the mythology of the Algonquian people. It is a malevolent cannibalistic spirit into which humans could transform. They were strongly associated with the Winter, the North, and coldness, as well as with famine and starvation. They were constantly searching for new victims. 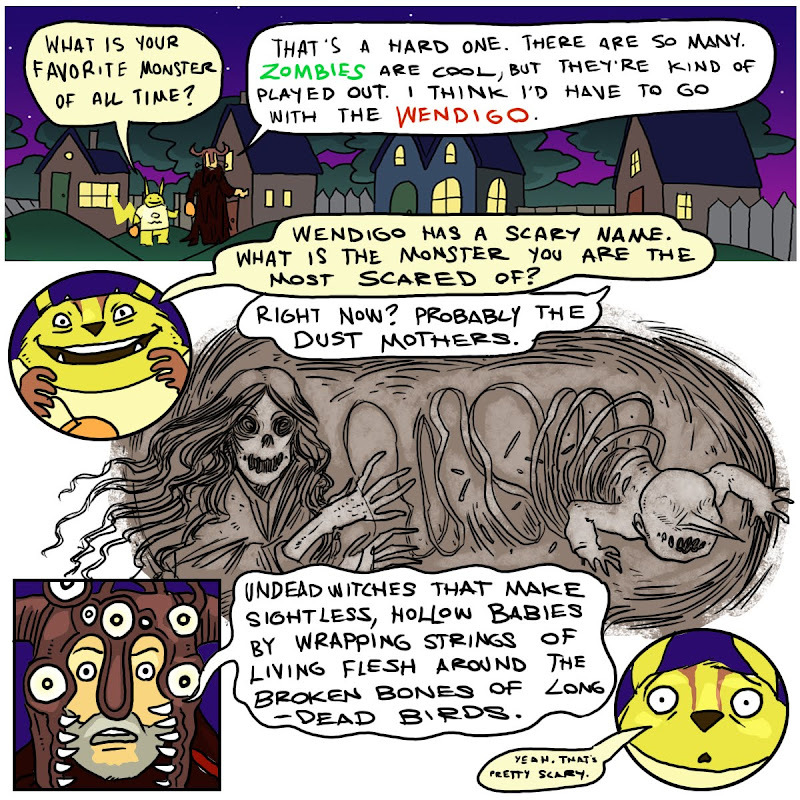 In some traditions, humans who became overpowered by greed could turn into Wendigos. Whenever a Wendigo ate another person, it would grow larger, in proportion to the meal it had just eaten, so that it could never be full. Wendigos were therefore simultaneously constantly gorging themselves and emaciated from starvation. I think Dean may be too scary for children, and loveable monsters and me. Dust Mothers indeed. Dust bunnies are scary enough. Except the rhymning ones. Was Dorothy Parker and Wendigo? Here is something that you may be scared of. If so, don't be greedy, and sleep with a 'Dirt Devil' by your bedside to vacceum the Dust Mother when she comes. Follow everything said, and you will live to see another day. That sounds EXACTLY like Dean. A horror comic is in your future, Nate. I would absolutely LOVE to do a horror comic. I hope you are right!